President Barack Obama said Sunday Kenya is at a crossroads "filled with peril, but also with enormous promise." He shared his outlook on the future of the East African nation during a speech in the capital, capping a two-day visit to his father's homeland where he was hailed as a native son. The president was introduced by his Kenyan half-sister, Auma Obama and welcomed by a cheering crowd at the Safaricom Indoor Arena. Obama thanked Kenyan President Uhuru Kenyatta for his hospitality during the visit and said he is proud to be the first Kenyan-American to become President of the United States. The president praised Kenya's progress since winning independence from British colonial rule in 1963, among them ending one-party rule and overcoming the deadly tribal and ethnic violence that broke out in 2007 and plagued the country for several months. "The people of Kenya chose not to be defined by the hatreds of the past," Obama said, "you chose a better history." 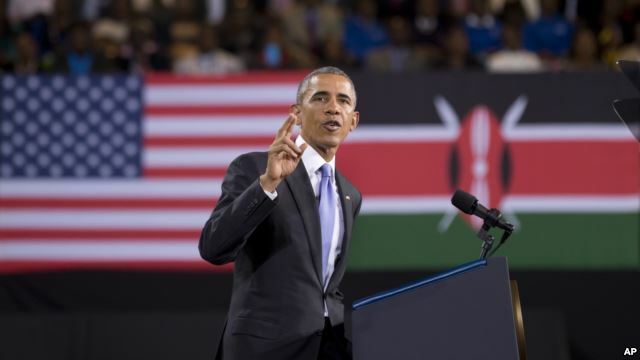 President Obama said Kenya's future success depends on three crucial pillars: strong and transparent democratic governance, universal economic development, and a strong sense of national identity that "rejects conflict for a future of peace and reconciliation." He also said that too often in Kenya, corruption is tolerated because that’s how things are done and that it's time to change that habit. He urged the country to increase efforts to root out official corruption, saying "every shilling that's paid as a bribe could be put in the pocket of someone that's doing an honest day's work." Obama also paid special attention to gender equality, saying "Kenya will not succeed if it treats girls and women as second-class citizens." He called for an end to the practices of forced marriages, genital mutilations and barring young girls from being educated. "These traditions may date back centuries, they have no place in the 21st century," the president said. Drawing a comparison to the Confederate flag debate in the U.S., he said just because something is a tradition doesn't make it right. He also called on young people "embrace diversity." The president held another event later Sunday in Nairobi, a conversation with civil society leaders. Obama flies later Sunday from Nairobi to Addis Ababa. As with his Kenya visit, Obama will be the first sitting U.S. president to visit Ethiopia. Once in Addis Ababa, Obama will be formally welcomed by the Ethiopian government on Monday. He also will meet with Prime Minister Hailemariam Desalegn, and the two government leaders will hold a joint news conference. Human-rights concerns loom large in the background of Obama's travels in Africa. Before he left the United States, human-rights groups urged him to call for fundamental rights reforms in both Kenya and Ethiopia. Ben Rhodes, the president's national security spokesman, said Obama will raise human rights issues in Ethiopia, just as he did in Kenya. During a press conference Saturday with his Kenyan counterpart, Uhuru Kenyatta, Obama said he believes the state should not discriminate against people based on their sexual orientation. President Obama ended a busy day in Nairobi Saturday at a state dinner hosted by Kenyatta. Obama noted that his Kenyan-born father and Kenyatta's father knew each other. "It would have been hard for them to imagine how their sons might be sitting here today," he said. He also joked that "some of my critics back home are suggesting that I'm back here to look for my birth certificate," a reference to accusations that he is not a U.S.-born citizen, which would make him constitutionally ineligible for the presidency. Kenyatta, the son of Kenya's first president, Joma Kenyatta, hailed the initiative begun in the late 1950s that allowed hundreds of Kenyan college students, including Obama's father, to study in the United States. Earlier Saturday, Obama addressed the Global Entrepreneurship Summit, being held in Africa for the first time. He said entrepreneurship in Africa helps break down barriers and build bridges between cultures, providing an alternative to violence and hopelessness. "Africa is on the move," he said, and "Kenya is leading the way." In his remarks, President Kenyatta spoke of Kenya's security struggles and its swiftly growing economy. He told his audience of entrepreneurs and investors from around the world to tell friends everywhere that "Africa is open and ready for business." On Friday night, the president had dinner at his hotel with his Kenyan relatives, including his step-grandmother, Mama Sarah, and his half-sister, Auma Obama. U.S. officials said security concerns ruled out a presidential trip to the west Kenyan village of Kogelo, where his father was born and is buried.